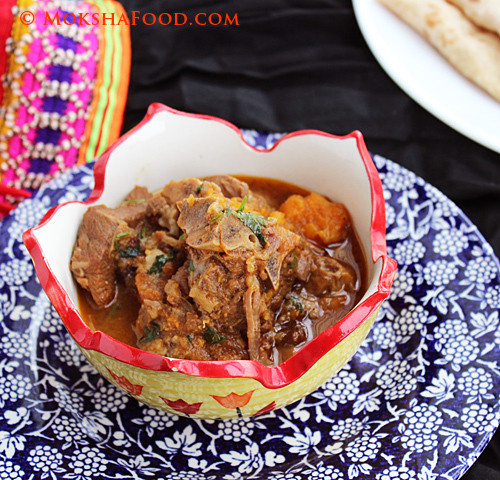 Moroccan Goat with Sweet Potatoes and Raisins! Sunday is usually Goat meat/mutton day. I have exhausted all recipes within the Indian cuisine profiles so now moving on to International shores. Yesterday i tried Moroccan style. 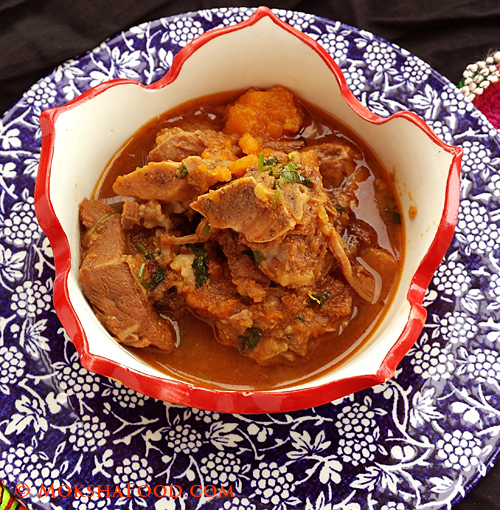 Usually the Moroccans use lamb but the recipe worked great with goat meat too. Recipe Courtesy : Gordon Ramsay. I love trying international flavors but avoid stuffing my pantry with every kind of spice mixes. It's not cost effective. Also since these recipes are prepared only once a while, the spice blends would lose their flavor over time. I rather buy whole spices and use them as directed in the recipes. This curry is a fragrant, mild curry with sweet undertones. This recipe uses sweet potatoes and raisins to create the sweetness. Other alternative is to use carrots and apricots. It is meant to be enjoyed with couscous but since its out of reach for us, we scooped up the meat and sauce with gluten free sorghum chapatis/flatbreads. Heat 2 tbsp of olive oil over medium heat. In the same pan, drop the onions and saute till they have caramelized nicely. Stir in the garlic and ginger. Heat another small pan on medium heat and gently roast the cumin and coriander seeds till fragrant.Cool and grind into a coarse pdr. In the larger pan, now add all the spices -cinnamon stick, paprika, saffron strands and the cumin-coriander pdr. Add another tablespoon of olive oil, if needed, to saute the spices well. Now add the chopped tomatoes and saute till they form a nice pulp. Stir in the meat, sweet potatoes and raisins. Flavor with salt and cinnamon pdr. If cooking in the saucepan or oven , you would have to cook the meat on low temperature for about an hr. I prefer to use the pressure cooker on low heat as am done in 30 mins. The Sweet potatoes may melt into the curry creating a nice texture and adding sweetness. Serve hot garnished with chopped cilantro. Healthy dessert: Dried Figs Chocolate Fudge! Mint Rajma - Kidney beans in a chunky sauce! Gluten Free Vegan Chocolate Pumpkin Brownies! Gluten Free Vegan Orange Cinnamon Crumble Cake! Chicken Kofta Curry / Chicken Meatballs in sauce!